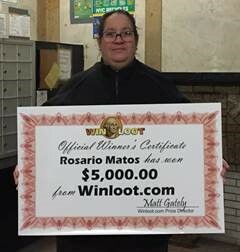 Yesterday morning the Winloot team had the pleasure of handing a $5,000 check to our latest big Instant Bonus Game winner, Ms. Rosario Matos of the Bronx, NY. The previous Sunday, Ms. Matos matched 10 numbers in the Instant Win Bonus game and since she lived so close to the Winloot offices, we took the opportunity to deliver the check in person and hear in her own words how Ms. Matos felt about the site and about becoming a winner. After navigating a some rush hour traffic and carving out a parking spot in the snow left over from last week’s north east storm, the two members of the Winloot team met Ms. Matos downstairs in the lobby of her apartment building. Even though we called ahead to let her know we were coming, we could tell Ms. Matos still couldn’t quite believe she actually won. Of course, any remaining doubt she might have had seemed to vanish once we handed her the check with the instructions Pay to the Order of Rosario Matos the sum of Five Thousand Dollars. 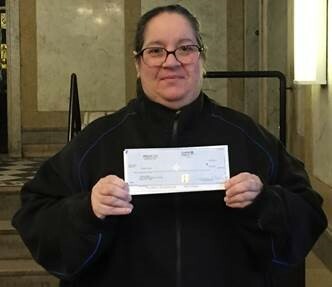 Holding the check for the first time, Ms. Matos smiled as she recounted that she signed up for Winloot last October and started playing regularly. 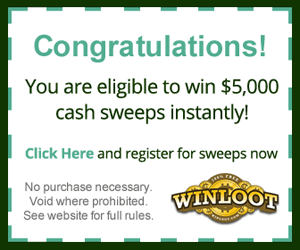 She says she only plays a handful of online sites but was surprised to learn that two of the other sites, UWinIt.com and RewardIt.com are also part of the Winloot family. She said that even though she didn’t win right away on Winloot, she could see that she was matching numbers and just knew that if she kept at it one day she would win a prize. The fact that it was a $5,000 prize only made the wait that much sweeter. As for what she plans to do with the money, Ms. Matos said she’s already decided to put at least half the money away and while she has some bills to take care, she’s also hoping to spend a little on something fun for herself. Besides she said, “I’m going to keep playing so who knows, I just might win again.” And we hope she does too.